The summer months are a time of relaxation, with graduation parties, holiday parties, barbecues and family gatherings all happening outdoors. 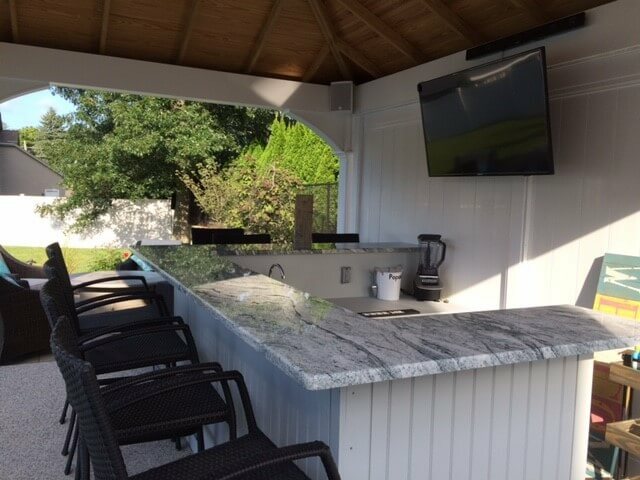 Outdoor audio and video systems can elevate your outdoor living spaces with high-quality equipment that enhances the aesthetic qualities of your space. Bring world-class entertainment to your porch, deck, lawn, pool, or hot tub with specialized audio and video equipment that withstands extreme heat, cold, and regular outdoor wear-and-tear. Fill your space with an immersive surround sound experience with our different styles of speakers – wall mounted, in ceiling, rock and landscape. And with distributed A/V, you can blend your inside and outdoor entertainment together. We will design an outdoor entertainment area to fit your lifestyle and your budget! Call now for a free in-home consultation.